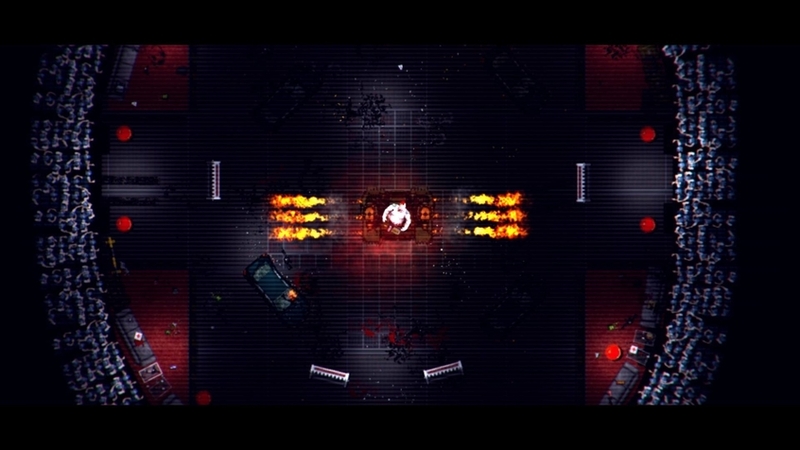 Garage is a top down shoot em’ up from tinyBuild Games that plays very similar to Hotline Miami from Abstraction games. The game is set mostly in an underground mall named The Garage hence the title of the game. 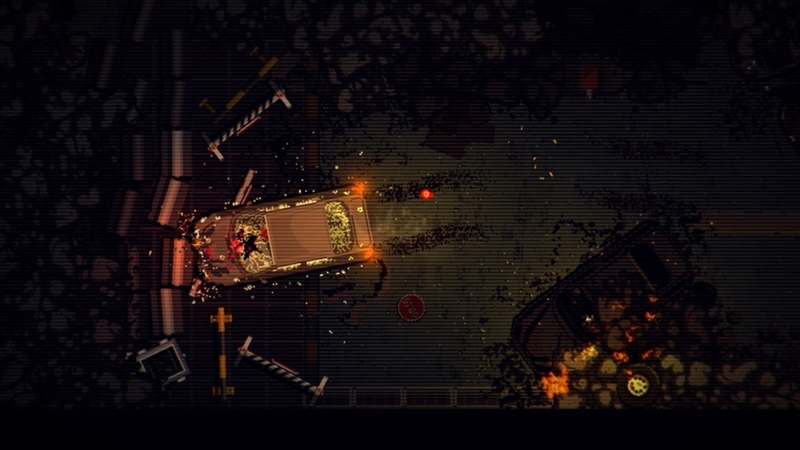 You play as Butch, a drug dealer who has woken up and emerged from the trunk of a car. As butch you will fight your way through the underground garage. Along the way you be assisted by a mysterious woman who goes by the name Anaconda. The two of you will help each other out so that both of you can survive long enough to breath fresh air. 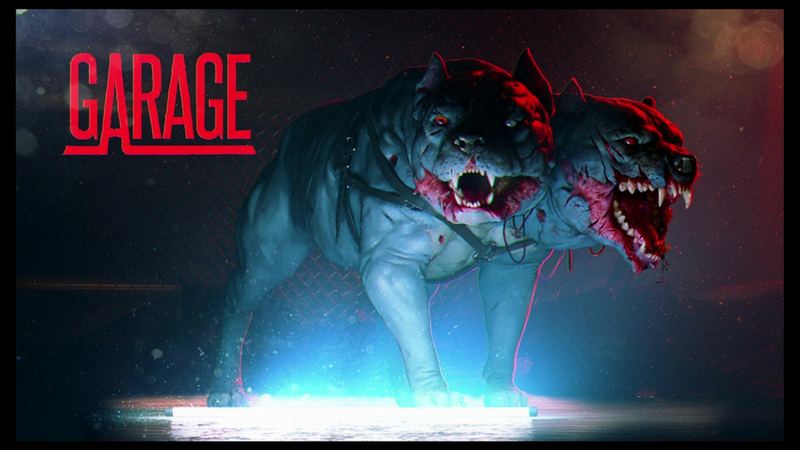 Garage has a story that is more or less forgettable. The action and environmental exploration greatly overshadows anything that might be presented before you story-wise. In a game like this the story is put on the back burner. While forgettable it has it moments where it is a little humorous. Butch as times throws out some pretty funny lines to Anaconda and she usually responds with something that puts him down. Garage tries to get us interested in Butch’s past but like we said before it’s not really that interesting. If the story was taken out of Garage the game would still be the same game. Only without us literally getting dialogue shoved in our face at random times. However it is good to let us know who our character is, giving our characters a reason to keep fighting, other than wanting to not get eaten alive. Garage takes it name from it’s setting. Set in a unbelievably large underground mall named The Garage. The environment is easy to navigate with hallways and tight walkways to point you in the right direction. Some areas can only be accessed by finding keys and kicking open doors. Be careful though, once you open a door anything can come out. 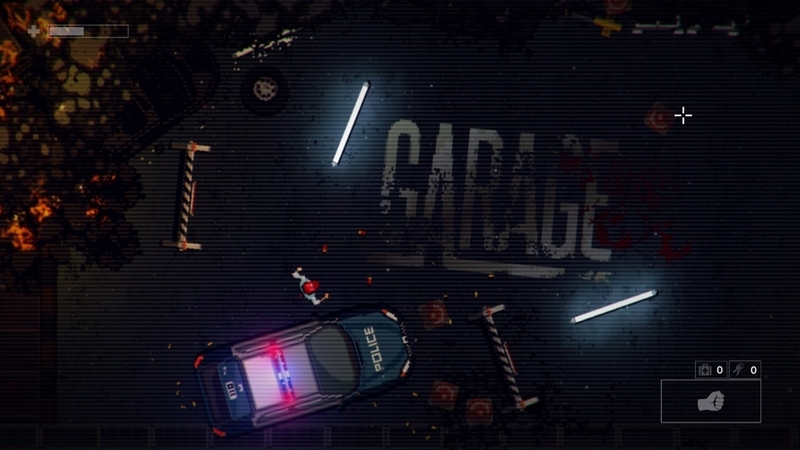 Garage is a very dark game, and at times weapons as well as items and enemies can blend in with the environment. This makes it a bit difficult when you low on health and ammo. There are secret rooms hidden throughout garage that can be access by bashing open broken walls. These rooms can contain extra equipment like ammo, armor and medkits. They are hidden very well and it doesn’t hurt to try and basha wall when you think one may be near. There are also locked boxes that contain valuable look like medkits and new weapons. Each box has a code that can be found in the environment. It won’t be so on the nose however. The code may be hidden for example in a television broadcast or by numbers in different areas of your current level. There is also a noticeable difference when playing in handheld mode vs docked. 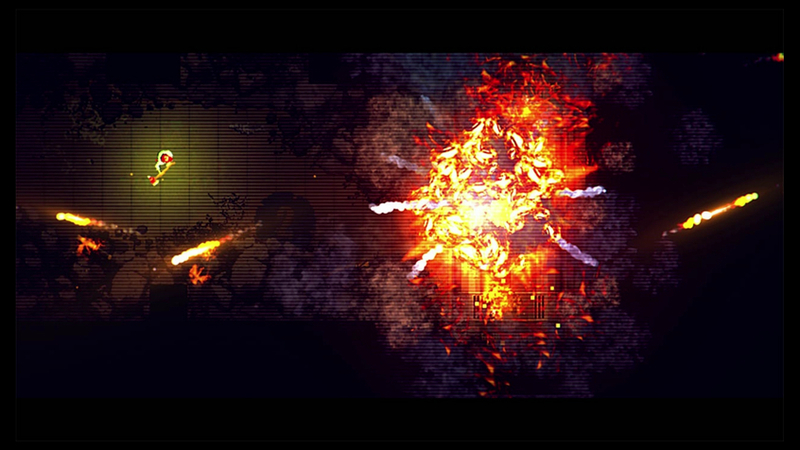 In handheld the game becomes much darker and low-res. 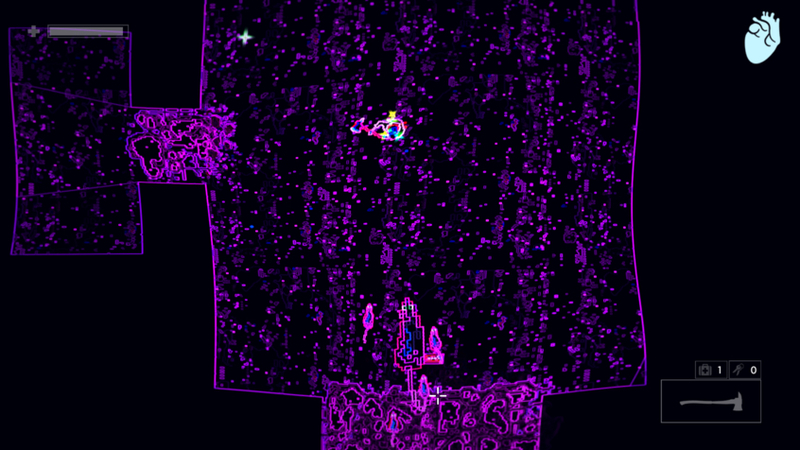 Making it even more difficult to distinguish objects and enemies. We recommend playing Garage indoors where no glare is present. The setting for Garage works with it’s low budget zombie movie theme. Environmental design becomes really good especially in the later levels. 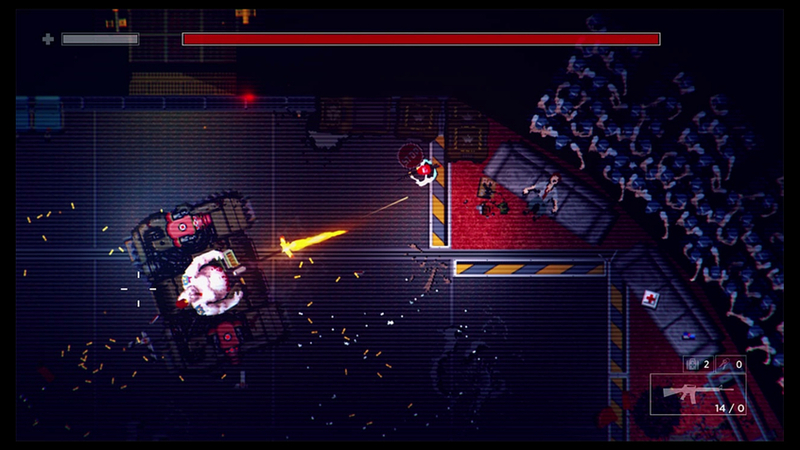 The bread and butter of a top down shoot em’ up is it’s combat. Garage plays very well, once you get used to the controls. 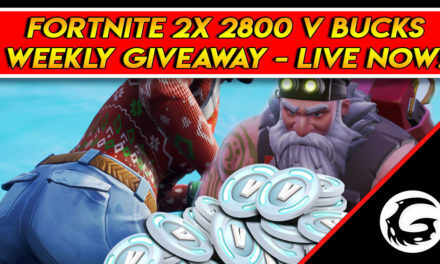 In your first few hours your going to be begging for a keyboard and mouse. After awhile you learn to live with the movement and directional aiming of the two joycon’s. You move around you character with the left joysticks and aim with the right joystick. Movement isn’t that bad but aiming is another story. The controls for aiming or very sensitive and it takes awhile to get it down. You’ll find that rats are a big problem because you have to stomp on them twice to kills them or shoot them, but they’re so tiny and fast that you’ll lose half your health before killing one rat. Players can cycle through weapons with the R button and can roll with the L button. Be careful when rolling, Butch will get tired if you roll too much at one time. ZL controls your kicking which you’ll use to kick open doors, rats and boxes. ZR is your shooting and swinging button. You have a variety of different weapons to use against your undead and not so dead enemies. Different weapons have different effects. For example the pistols is more accurate and more likely to pull of headshots. The Uzi is better for attacking multiple enemies at once due to its high spread. We find the shotgun to be out favorite as it down a whole lot of damage and when up close can one shot many enemies. Enemies variations are good and noticeable. You have your standard zombies, which can be quick or slow. Next comes you humans which are armed soldiers with varying armor and health amounts. 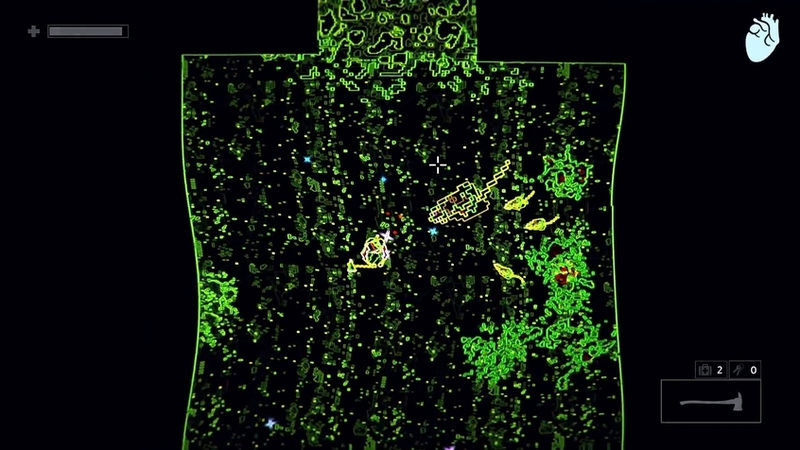 Then you have you mutated being which can take a lot of damage and are considerably harder to bring down. Enemies are colored differently and it’s easy to tell who you up against. 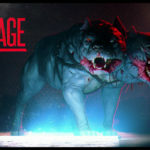 Boss fights are nice and accompanied with the games awesome soundtrack makes for a great encounter. We just wish they were more frequent, as the times in between feel a little quiet. Ammo is spread out generously, and is color coded. You can find ammo dropped from enemies, lying on furniture and found in boxes. You’ll want to keep your gun reloaded when not in combat or whenever you get the chance. Reloading in the middle of a fight can cost you. Garage plays to it’s theme well. 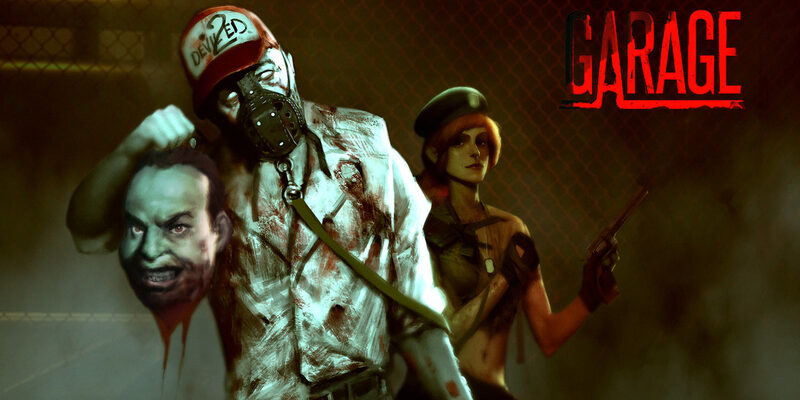 A b-movie style zombie shooter. Combat is challenging and at times unforgiving but it’s the best part of the game. The story is forgettable but doesn’t hurt when it does show it’s head. Controls are sensitive and take some time to get used to, but in the end work pretty well, we still wish we had a keyboard and mouse but we’ll survive. The setting is nice and plays well with the controls and theme. Hidden rooms and loot boxes are something we explore the territory for. As we do explore we see just how well crafted the environment really is. Garage is a good game but it’s something we’ve had before. We don’t really see anything new that this game delivers. It’s nice to have a game like Garage on the Nintendo Switch as these top down shoot em’ ups are very addictive and offer high paced action. Overall Garage is a fun game and we recommend you try it out as well, especially for the price. Leave a comment down below and let us know your thoughts! Also check out the video below on our Youtube Channel.